(Bloomberg) -- So who are you voting for? In Brazil today, that’s an explosive question. If your answer is the former Army captain Jair Bolsonaro, you are immediately branded a “fascist” by some. If your answer is the Workers’ Party candidate, Fernando Haddad, then you are a “communist.” People hurl all sorts of other ugly, and at times absurd, insults at one another in these exchanges: ignorant, corrupt, wimp, racist, feminazi, Bolsonazi. It’s gotten to the point where even the most mundane parts of daily life -- waiting for the elevator, taking a cab, bumping into a neighbor -- can quickly turn into full-blown screaming matches. The tensions are dividing friends, family and colleagues. Many have taken to proclaiming that they’re voting for neither, whether that’s true or not, just to sidestep the whole mess. The surge in polarization here feels a bit like it did in the early years of the Hugo Chavez regime in Venezuela or, more recently, like it did during the rise of Donald Trump. This Brazil election, which is almost certain to go to Bolsonaro, shares much in common with the 2016 U.S. election. For starters, both are in large part a reaction to economic woes. In Brazil, a brutal recession swelled the ranks of the unemployed to more than 12 million last year. Murders soared to almost 64,000. Adding to Brazilians’ outrage has been the seemingly endless flow of news documenting the vast sums of wealth that politicians accumulated abroad from the sprawling kickback scheme known as Carwash. But for detractors of the two men, there is plenty to latch onto. 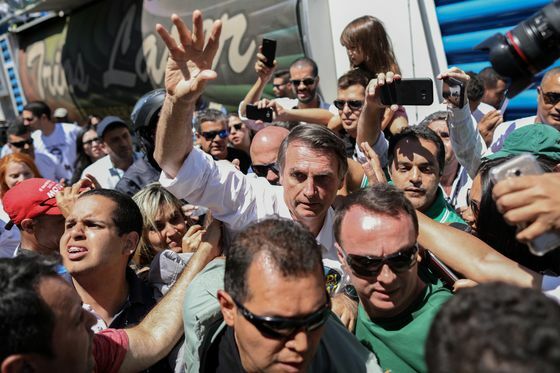 Bolsonaro, who pushes a free-market and tough-on-crime platform, has stirred up one controversy after another with his comments on women, homosexuals and Brazil’s dictatorship. 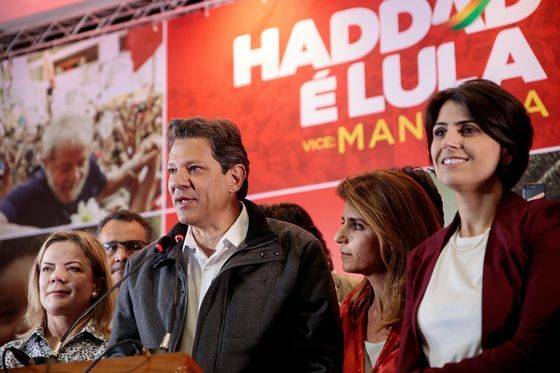 Haddad, who now essentially campaigns as the anti-Bolsonaro, has to overcome the Workers’ Party baggage. It was in power for much of this past decade’s collapse. The run-off between them is slated for Oct. 28. The tensions are likely to linger for a long while after. Celebrities have found the situation tricky to navigate. Pop star Anitta, for instance, has been harshly criticized by her large LGBTQ fan base for not positioning herself against Bolsonaro right away. Meanwhile, country singer Marilia Mendonca received threats for posting the #Elenao (#Nothim) hashtag used to protest him. Political violence in general is on the rise in Brazil. Bolsonaro himself was stabbed during a rally last month and continues to recover from his wounds. Social media, of course, is just further whipping up the passions. So too are things like dating apps, where people sternly warn Bolsonaro backers -- and sometimes Haddad backers -- not to click on their profile. And on WhatsApp, even the tamest, most peaceful chat groups can turn savage on short notice. Family chats are particularly susceptible to this. It might start with, say, a distant aunt who, rather than posting her usual “good morning” note alongside images of cats and flowers, decides to post a meme praising Bolsonaro and his hard-line approach. Within seconds, all hell breaks loose. And whichever side the brothers and sisters and sons and daughters and nephews and nieces pick, they are instantly bombarded with derogatory videos and other news items (usually with no attribution) disparaging their candidate. The feud will often only end when some family members just give up and abandon the group. What’s left behind is a small number of people who share the same views and chat, in quieter tones now, among themselves.